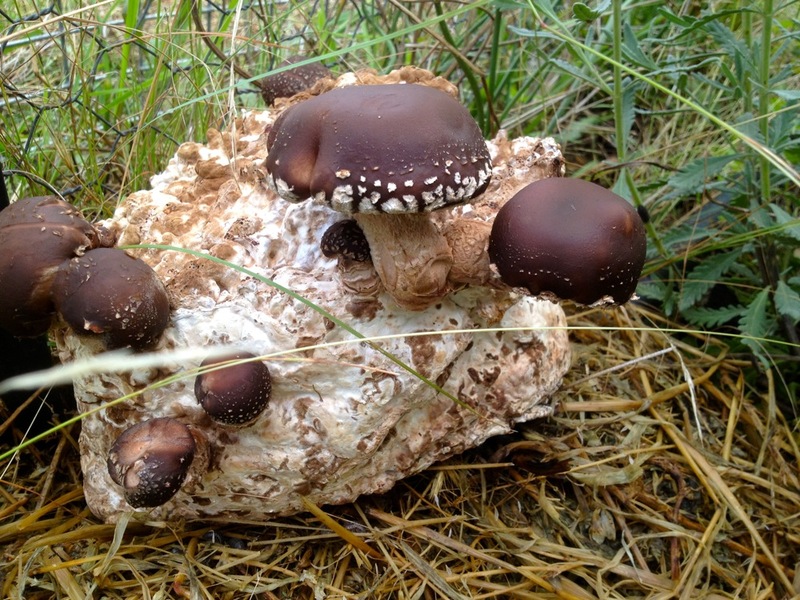 We’re getting very excited about growing delicious culinary mushrooms at Milkwood. Ever since we ran our first mushroom cultivation course in January, they’re springing up all over the place. 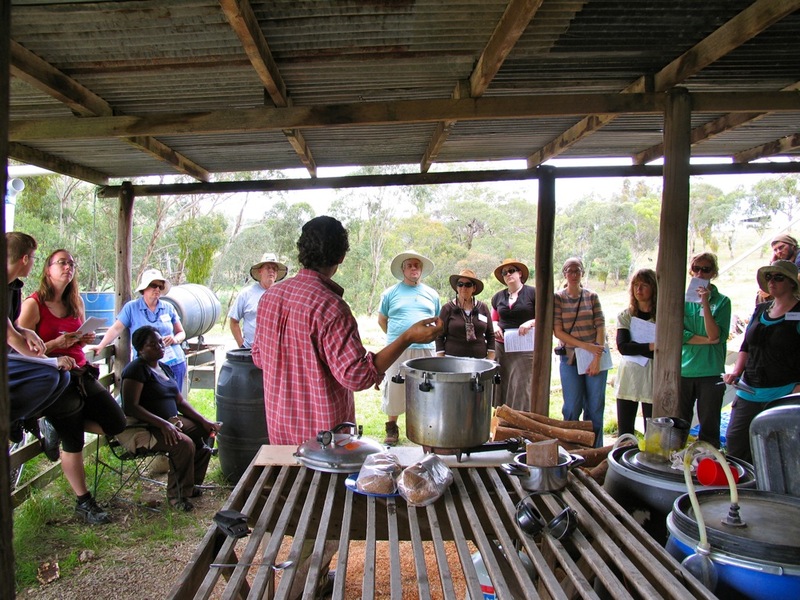 The next course we’ll be running on mushroom cultivation is in Sydney in May. 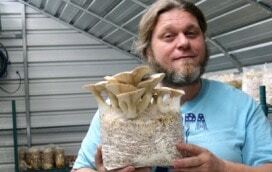 As you can see, it’s aimed at folks who really want to get going on home mushroom growing, using their own natural resources wherever possible. Mushroom cultivation is actually very simple once you get the hang of it, it’s just getting over that first big bump of understanding how fungi as a kingdom works under cultivation, what you do and don’t need to get going, and how to approach it all, and what to look for, and when to do the next step. 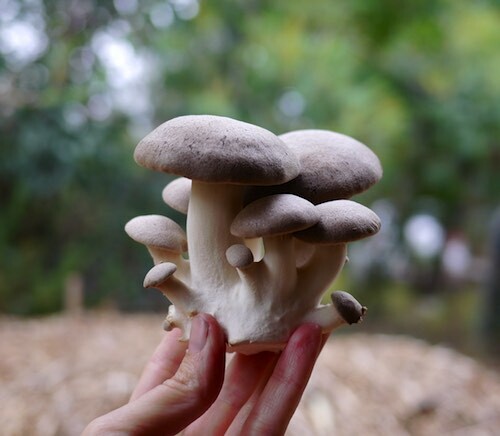 What we’re trying to do with this course is get students worded up on how to grow mushrooms themselves from scratch in enough different ways so that you can adapt this knowledge to whatever your situation might be – leafy backyard, damp area under the house, woodlot or forest. 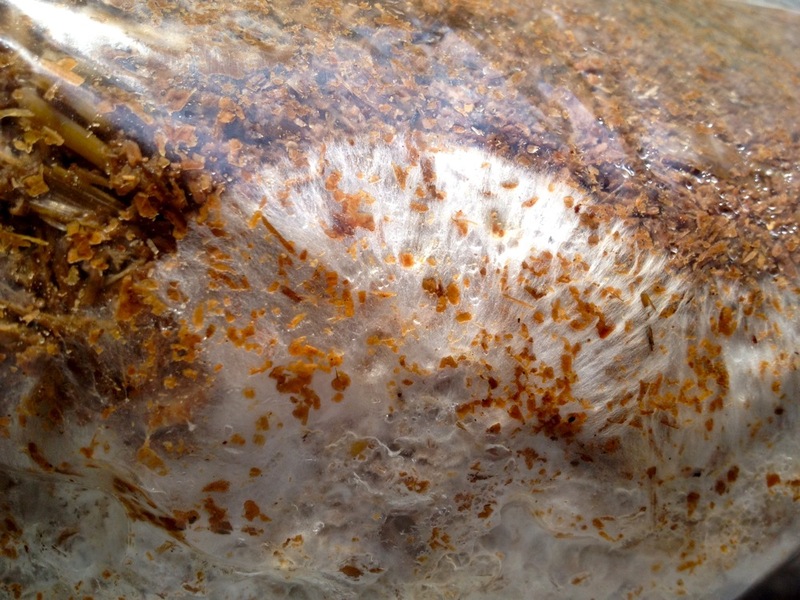 We’ll be bringing a heap of new and interesting types of cultivated mushroom spawn in bags for the students in May, as well as taking us all through the techniques. 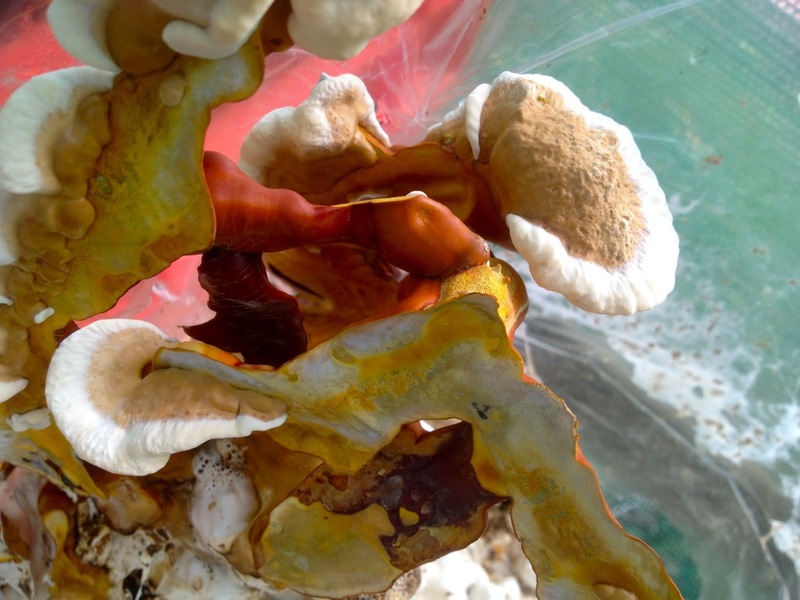 Exotic reishi mushrooms grown in the same way – these are highly medicinal and used extensively in chinese medicine.. 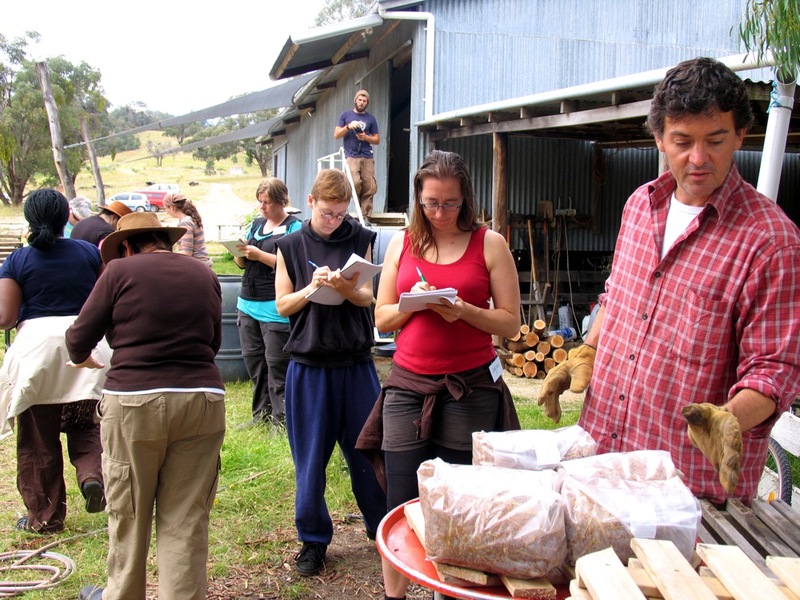 Thanks also to all the students that have been through our short and two-day mushroom courses so far – your enthusiasm & suggestions have been valuable in figuring out how to craft the best mushroom cultivation course we possibly can so that more people can get growing! 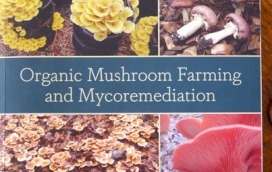 We run Mushroom Cultivation courses! Mostly in Sydney, at this point. So you've got your bag/jar of spawn, and you're ready to turn it . .
One of the most delightful things that comes out of our courses i . .
Wow, this book is a cracker. Friendly, in-depth knowledge at its . . Very cool! I’m just getting into mushrooms myself and am lucky that our farm has a lot of great wild mushrooms including oysters and puffballs. Just a wee correction on the last photo. Reishi is Ganoderma lucidum (that’s it in the photo), whereas the artist’s conk is Ganoderma applanatum. Wow, never heard of that. Seems like sort of a waste of a reishi. I like the way of explaination. Its vey good. I like very much. I like to grow mushrooms. I’m trying to grow these on a log on my deck. So far, not much luck, but I am hoping as things get warmer and more humid I will see something. Hi. 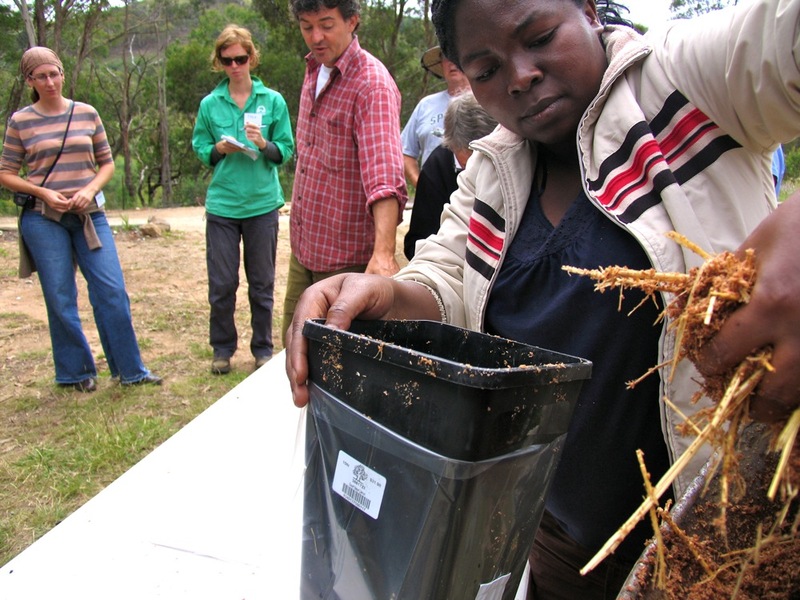 Is eucalyptus sawdust suitable for oysters(or any other mushrooms)? If not what timber is suggested? Fantastic, thanks…..what material are the bags made of (to hold & steam-sterilise the substrate)…plastic? 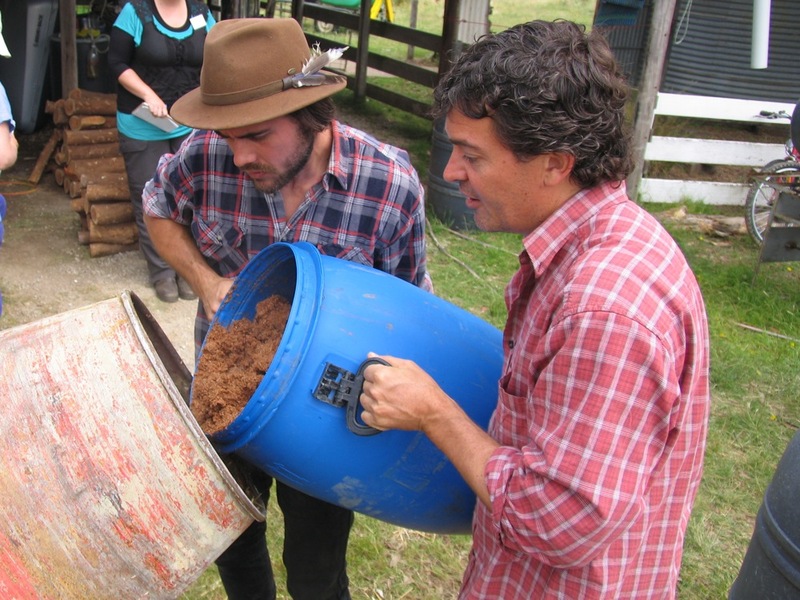 Where do you get the bags that can hold up to the heat thats used to sterilize the sawdust/straw ? 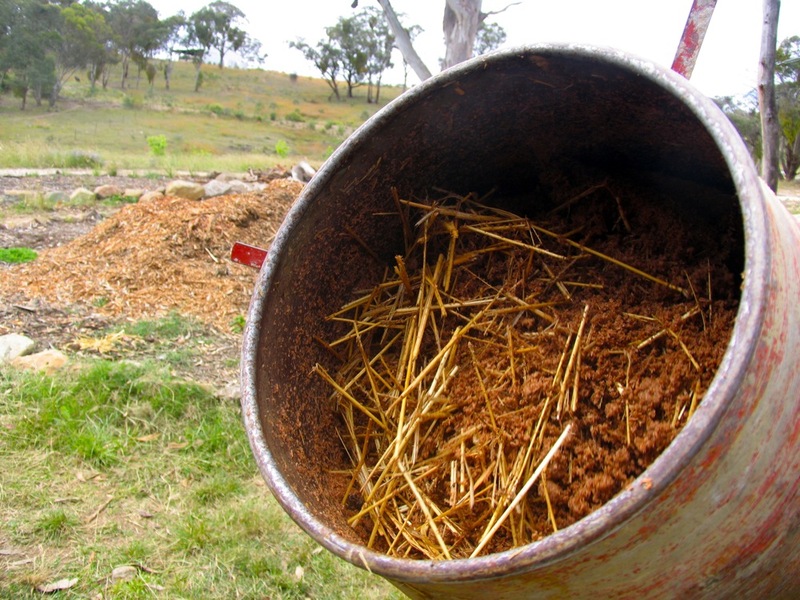 I am going to try my left over Shiitake dowels in a sterilised mixture of straw, & sawdust/shavings in plastic bags. Nobody has been able to tell me if it will work, but here goes!! I noticed you didn’t seem to have gotten a reply yet. I know that this site is veryt popular (with good reason!) and busy so maybe you got missed. 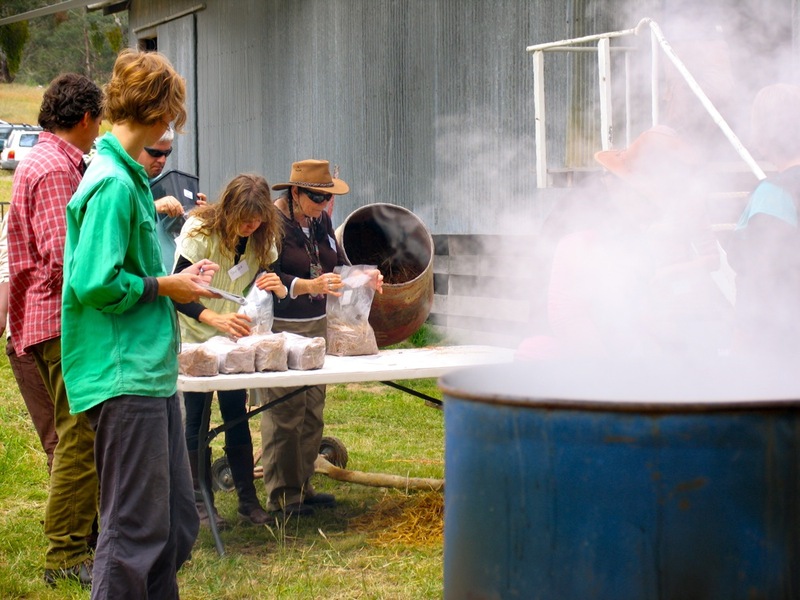 I know that the Milkwood team don’t sell mycelium but they are big fans of http://www.forestfungi.com.au where you can, along with great info about growing including a DVD. They also recommend http://unicornbags.com/theblog/mushroom-bags/ for buying growing bags. 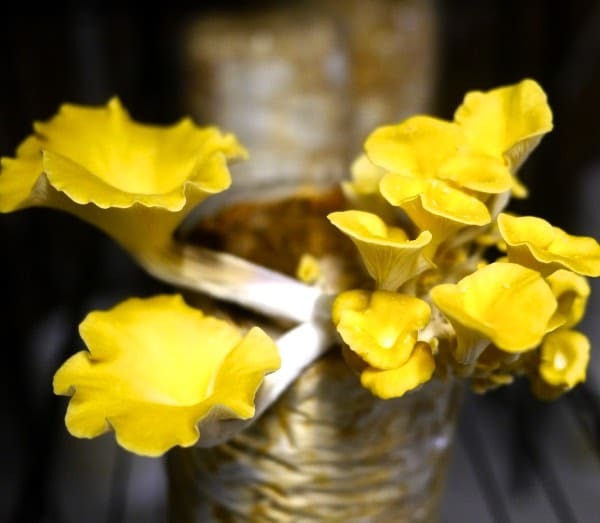 I’ve recently ordered some ready-to-go kits from here: http://www.fungi.net.au/grow_your_own_mushrooms/ This is my first time with this company so I don’t know how they’ll go but the prices are great and they have some lovely varieties including coloured oysters. 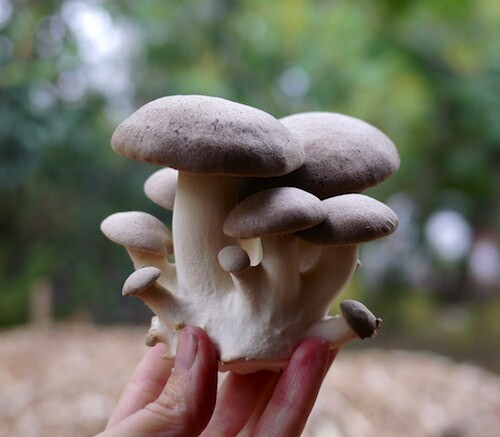 There’s a beautiful post on the Milkwood site about growing mushrooms under a tree, and the spawn for this variety is available here: http://www.fungi.com This is also just a wonderful site about all things fungus. PS: I’ve sterilised straw and sawdust directly (no bag) using a pressure cooker I keep for this purpose. It works brilliantly. 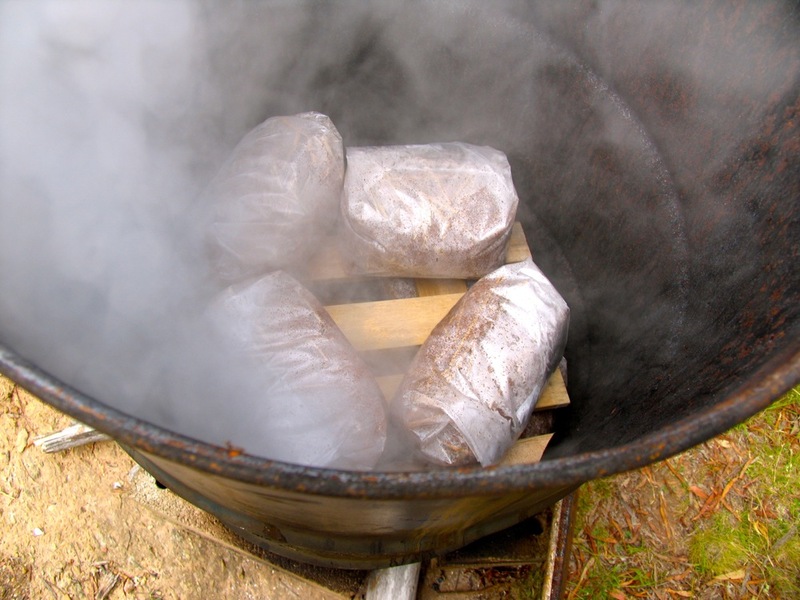 If you google mushroom growing you’ll find all kinds of different growing methods and sterilisation techniques, including putting it in an old esky and putting boiling water over it. 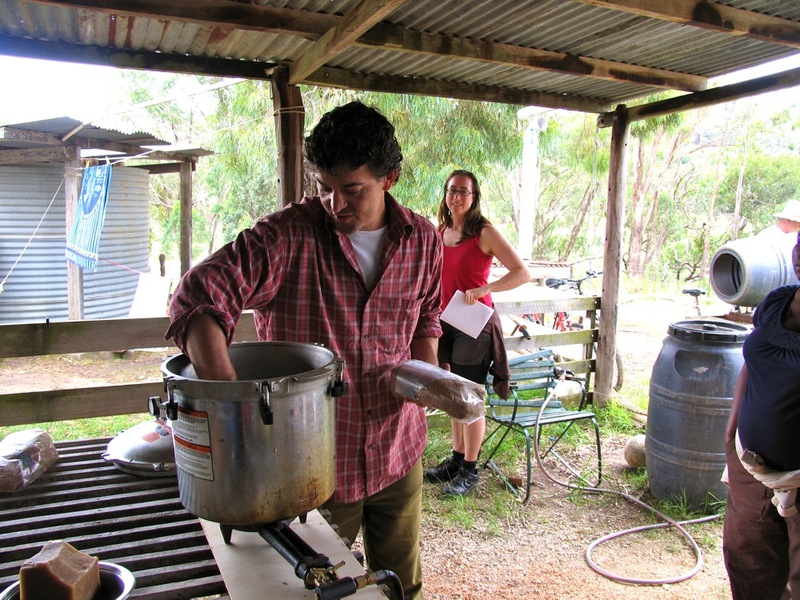 In the Milkwood post about setting up an outdoor mushroom garden under a tree they just soaked woodchip in a drum. It’s not perfect but it will kill off anything that needs air. shiitake from sawdust spawn- how long befor yu get a first flush in a laundry basket? wayne Abiah- Lae. Can you sterilize in a microwave? Probably, providing that the temperature of the substrate gets around 100*C. Basically just put your wet substrate in some microwave safe glass/ceramic containers (plastic may melt, and metal may cause arcing), and heat it. It probably should be done for about a minute more than after you start seeing steam or boiling water on your substrate. This might be good for small batches, although steam-sterilizing in a large drum seems more convenient if you are sterilizing large amounts of substrate. Hi. I am trying to grow King oyster mushroom on meranti subsrate. Is meranti suitable?